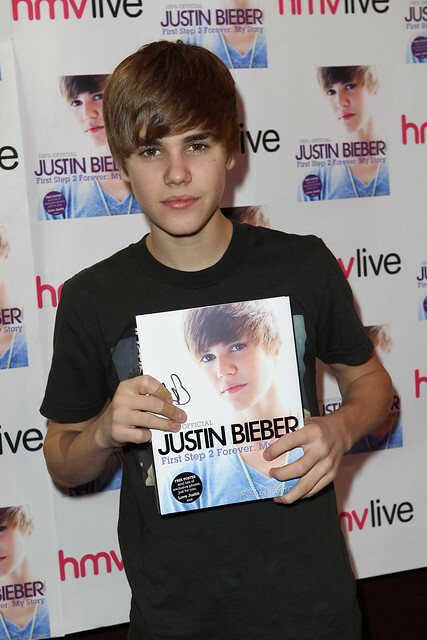 Justin Bieber signing and photo event at The Garage, London, December 2010 a photo by hmv_getcloser on Flickr. Just as we thought celebrity memoir authors couldn't get any younger, along comes teen heartthrob singer songwriter Justin Bieber, who at the ripe old age of 16, published an autobiography - Justin Bieber: First Step 2 Forever: My Story. Love him or hate him, it's difficult to ignore the Canadian-born celebrity whom The Guardian described as “more influential online than the Dalai Lama or [the] US president” - when he turned 17 a few days ago on 1st March, Twitter was swamped with messages from his adoring fans and those same fans turned out in their thousands, some camping on the street overnight to be first in the queue, for the chance to meet and greet the star and have a copy of the memoir signed in person at book stores across the globe. Packed with picture spreads and original Tweets from Bieber, First Step 2 Forever is clearly a must have for the super-fan and a signed book investment for collectors. Certainly one reviewer on Amazon claims that it's “the best book in history”, but I think the rest of us might take that claim with a pinch of salt!